Lobelia, marked by intense colors and masses of small, tubular blooms, provides interest to the garden all summer. Annual lobelia (Lobelia erinus), grown as a perennial in the warm climates of U.S. Department of Agriculture plant hardiness zones 9 through 10, is a bushy, low-growing plant often used in flower beds and hanging baskets. Perennial varieties, which include cardinal flower (Lobelia cardinalis) and lobelia speciosa (Lobelia x speciosa), are tall, upright plants that reach heights of up to 4 feet. They are hardy perennials that grow in USDA zones 3 through 9. Annual lobelia requires frequent watering during the growing season because the short roots remain near the surface. 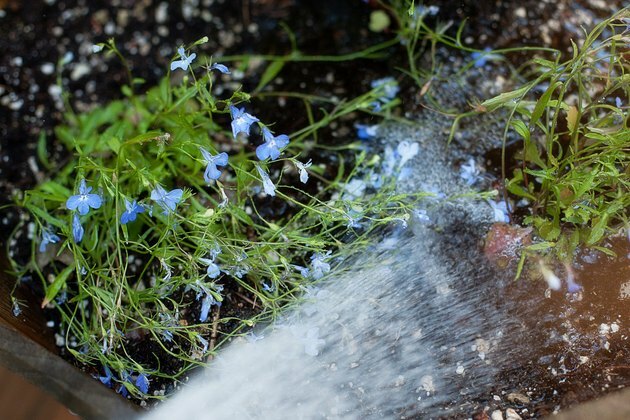 Water slowly, using a garden hose or drip system, to saturate the soil to a depth of 6 to 8 inches. Allow the top 1 to 2 inches of soil to dry before watering again, as poorly drained, soggy soil may create root rot or other fungal diseases. Perennial varieties benefit from regular watering the first year. Thereafter, the plants are drought-tolerant, and water is necessary only during periods of hot, dry weather. Annual and perennial lobelia varieties benefit from application of a dry, 5-10-10 or 5-10-5 fertilizer at planting time. 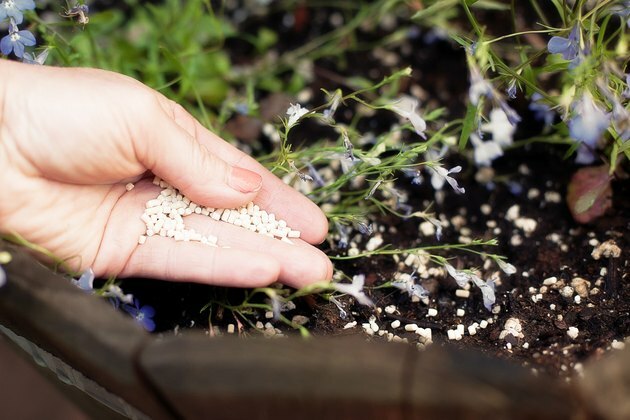 Dig the fertilizer into the ground at a rate of about 5 pounds per 100 square feet of planting space. Repeat every spring for perennial varieties. 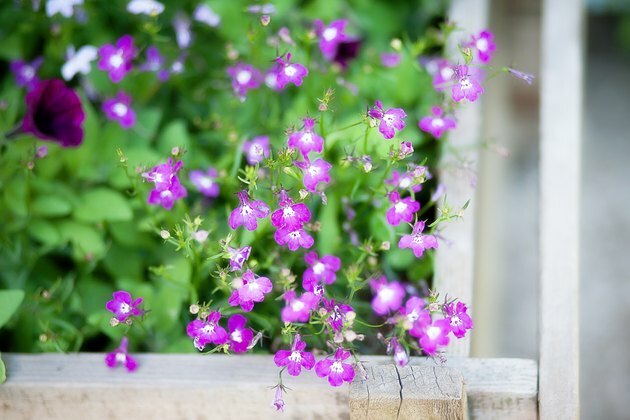 Although a yearly feeding is sufficient for perennials, annual lobelia requires frequent feeding to sustain energy for blooming throughout the season. Use a liquid fertilizer with a ratio such as 12-4-8, mixed at a rate of 1 teaspoon per gallon of water every two to three weeks. 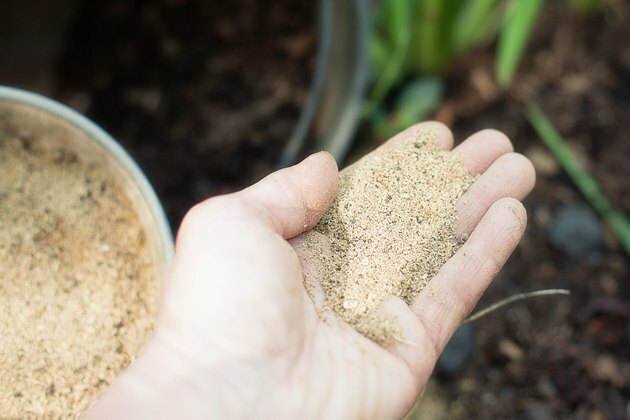 Always apply fertilizer to damp soil to prevent damage to the plant; then water thoroughly to distribute the fertilizer evenly around the roots. 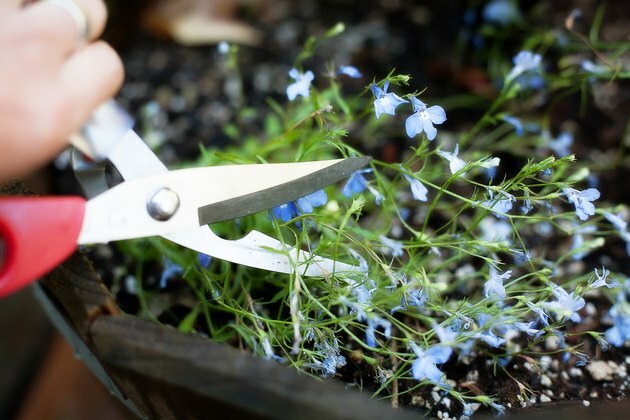 Pinch back the tips of young annual and perennial lobelia plants by 1/2 to 1 inch to create full, bushy plants. Thereafter, shear annual lobelia by about half its height if it becomes tired and leggy in midsummer. To prevent spread of disease organisms, disinfect shears and other cutting tools by wiping the blades with rubbing alcohol before and after each use. You can also sanitize the blades with a mixture of 1 part bleach and 9 parts water. Deadhead perennial varieties to keep the plants looking their best and promote development of flowers throughout the growing season. To deadhead, pinch off wilted blooms along with the stem down to the next branch or leaf. Perennial and annual varieties benefit from 2 to 3 inches of mulch to keep the roots cool and moist during the growing season. Keep a layer of mulch around perennial varieties to protect the roots during the winter. Divide perennial lobelia every two to three years to keep the plant from becoming crowded. Lobelia is a pest-resistant plant; however, perennial varieties may be bothered by slugs and snails. If the infestation is light, pick the pests off by hand and drop them in a bucket of soapy water. Otherwise, apply slug bait at a rate of 1 teaspoon per square yard of planting area. Keep the container tightly closed, and store it in a locked place where it is inaccessible to children and pets. Plant lobelia with care because some varieties, including Lobelia cardinalis, are poisonous if eaten in large quantities.